On-page SEO enables Google to read and rank your website. Without it, major search engines can’t understand what you are trying to say. Our On-Page SEO services starts with in-depth research into the keywords that not only relate to your brand, but which also resonate with your target audience. Our SEO experts will work by strategically placing targeted keywords in optimal areas of your website and within your content, such as Title tags, Meta keywords and descriptions. Pool Marketing Site understands the importance of top-flight on-site optimization and makes it an integral part of every SEO campaign. Why? Because it’s essential to generating sales leads and revenue. Our On-Page SEO services most benefit those who pool company owners who want a full array of marketing services but don’t have the time to do themselves or don’t want to hire internally. 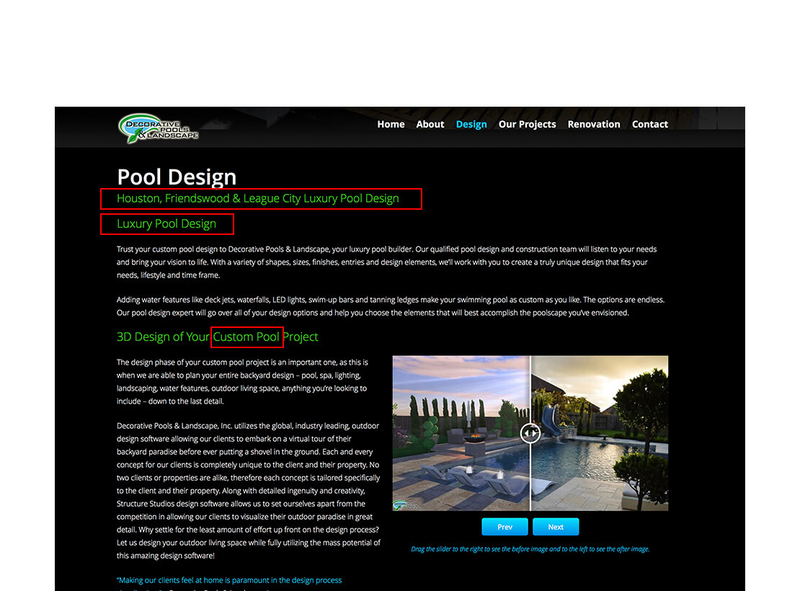 When we contracted to build a new website for Jo-Co Pools, back in 2015, while speaking with Patty Cohen, co-owner of Jo-Co Pools, we explained that their new site included on-page SEO being added to their new website during the build. As an example of how customers search for you on Google, we performed a Google search using the term Anna, IL pool builder. Jo-Co Pools appeared on page 2 of Google because of a positive review a customer who lived in Anna, IL had left for them. They were not appearing on Google for any other search terms. After we completed their new website and added the on-page SEO, Jo-Co Pools now dominates page 1 of Google for this and many other search terms.